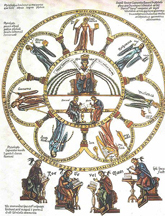 The 87th Annual Meetingof the Medieval Academy will take place this week from 22-24 March, Thursday to Saturday, in St. Louis at St. Louis University. Registration is strong and is expected to top 350. Plenary speakers will include Caroline Bruzelius (Duke University), MAA President Alice-Mary Talbot (Dumbarton Oaks) and William Chester Jordan (Princeton University). There will be fifty sessions over the course of the three days, plus receptions, a graduate student pub night, and a banquet on Friday evening. On Saturday the following will be inducted into the company of Fellows of the Medieval Academy: Brigitte Bedos-Rezak, (NYU, elected 2012), Monique Bourin (Université de Paris 1-Panthéon-Sorbonne, elected 2009, Corresponding), Charles Donahue, Jr., (Harvard, elected 2012), Kathryn Kerby-Fulton (Notre Dame, elected 2012), Monica H. Green (Arizona State, elected 2011) and Maria Rosa Menocal (Yale, elected 2011).